Handbook for a Post-Roe America is a comprehensive and user-friendly manual for understanding and preparing for the looming changes to reproductive rights law, and getting the healthcare you need––by any means necessary. Activist and writer Robin Marty guides readers through various worst-case scenarios of a post-Roe America, and offers ways to fight back, including: how to acquire financial support, how to use existing networks and create new ones, and how to, when required, work outside existing legal systems. She details how to plan for your own emergencies, how to start organizing now, what to know about self-managed abortion care with pills and/or herbs, and how to avoid surveillance. The only guidebook of its kind, Handbook for a Post-Roe America includes an extensive, detailed resource guide for all pregnant people (whether cis, trans, or non-binary) of clinics, action groups, abortion funds, and practical support groups in each state, so wherever you live, you can get involved. 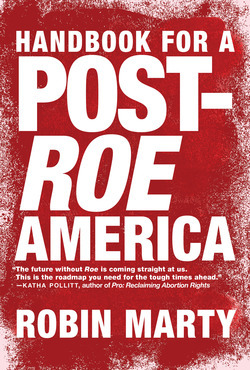 Robin Marty is a writer and reporter who covers abortion access and the pro-choice and pro-life movement. She has spent the last decade tracking abortion restrictions, visiting current and former clinic sites and interviewing activists on both sides of the abortion divide. Marty is a member of the American Society of Journalists and Authors, a Women's Media Center SheSource expert on reproductive rights, and an IFund investigative reporter for The Nation Institute. Her work can be found in Cosmopolitan, Politico, the Guardian, and other outlets. Her first book was Crow After Roe: How "Separate But Equal" Has Become the New Standard In Women's Health and How We Can Change That. Marty spent five years as the senior political reporter for Rewire News, a reproductive health and justice news site, where she covered state-based abortion bans and other assaults on reproductive rights. She lives in Minneapolis, MN. 301 York Street at 3rd St.